I have lightened my hair and now feel like myself again. Albeit a fake, peroxide version. I have also dipped my toe into the world of keratin treatments and had Kerastraight applied on Wednesday. This is one of the formaldehyde free versions and can be used on very damaged/coloured hair. That would be me. I am currently sporting a very flat hairstyle as I have to wait 48 hours until I can wash it out. This straight hair malarkey really does highlight how much of a pin head I have. However, it’s a small price to pay in the quest to eliminate frizz. I have been shopping. Quite a lot actually. This Topshop jumper jumped out at me in the Mall of the Emirates store. I love an immature sweat and especially when it comes in light grey. I also have been to Zara so much that the cashier said “welcome back” to me during my last visit. Needless to say I haven’t been back since. One of the best purchases was a cape. No, I am not joking. It’s a full on winter cape coat. I am preparing myself for a trip to New York in 2015 and possibly for the one day of genuine winter in Dubai in December. I am having a bit of a MAC Renaissance. That brand will never stop pulling me in and there is a Cremeblend blush that I cannot stop wearing. It’s called So Sweet, So Easy. When I saw it at the stand I wasn’t sure but swatched on the skin it gives that light pretty bloom. 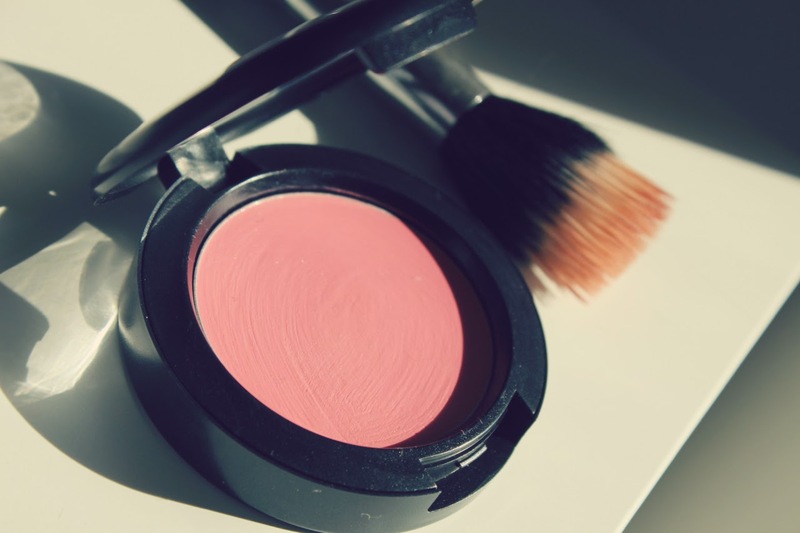 For a cream blush it also has decent staying power – and it is not at all sticky. I think Something Special will be next. Last but not least is my latest lipstick obsession – NARSAudacious lipstick in Charlotte. Wow Wow Wow. This is described as Oxblood burgundy and translates as a deep berry hue when worn. Of course it’s similar to Empress, the Hourglass stain that I blogged about recently, but definitely more wearable both in terms of it being a slightly less vamp-centric shade but also in formula as it doesn't pull as much moisture from the lips. Speaking of formula, I have some thoughts on that. So the Audacious line is intensely creamy. This is well known. I guess you can look at this in one of two ways: yes it makes colours feel nourishing when applied but it also can work against you. There is a lot of slippage, it’s difficult to apply without a brush and almost impossible to keep in place without a liner. They are very nice and all but in reviewing the marketplace I think I might prefer Estee Lauder Lipstick Envy, By Terry Rouge Terrybly or a good ole Amplified/Satin from MAC. Despite my preferences I do like the fact that this feels lightweight and gently fades over a couple of hours to a nice looking stain. Charlotte has definitely warmed me up to giving Audacious another try. your hair and makeup look gorgeous! 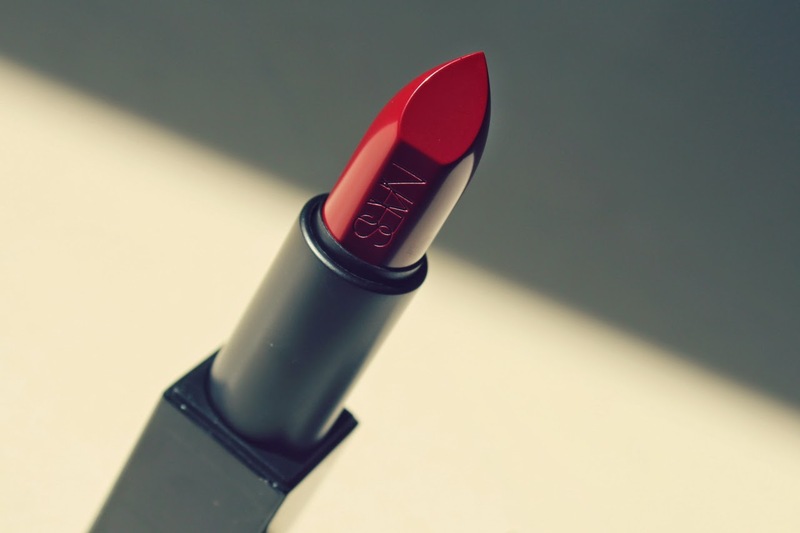 I am not getting 'it' about the Nars lipsticks too! I reviewed Brigitte recently and it kind of feels heavy and moisture sucking on me. But then people are raving about them so I feel like I need to buy at least one more to give it a fair trial!!! Your hair is such a gorgeous colour!! It's lovely, I'm so jel!! I've never commented here before but I just wanted to pipe up. One of the (many) reasons I followed you on YouTube and now on your blog is that you speak, and write so beautifully. Every description makes me feel indulgent and heady. I love it. I have three Audacious lipsticks and after wearing them for the last few weeks, I agree with you. 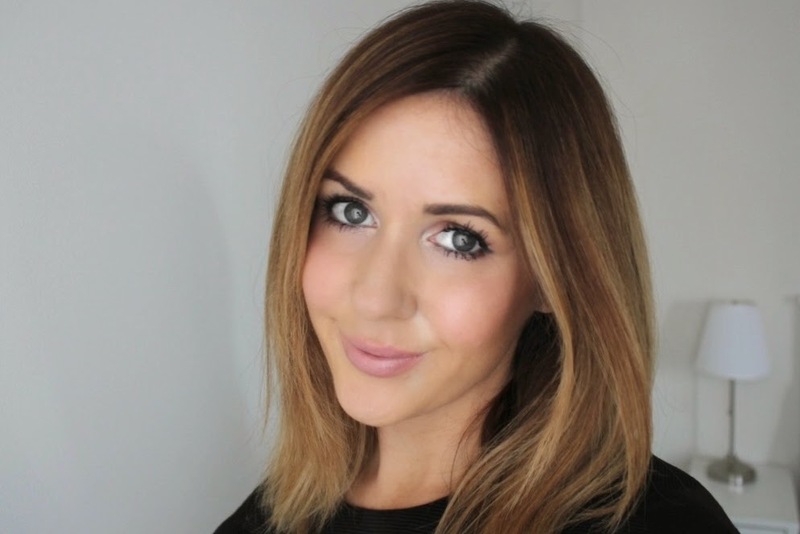 Have you tried the Givenchy Le Rouge? Same price point as the Audacious but I think the formula is way way better. The colour I have is Rouge Egerie, which might be right up your alley. Gorgeous colour....and the leather-like case is just amazing. I really like your hair straight Laura! I'm in love with the Audacious lipsticks... I've never found the 'right' formula for bright shades but these have convinced me to be more adventurous! Glad to see you're back Laura, I've missed your posts! Is that odd that I'm really happy you have lighter hair again? It looks really fantastic on you! I used to get a Keratin treatment done, but the salon I went to stopped doing it, and then I moved, and life just got into the way. Thank you for reminding me, I may just have to go on a hunt once things stop being full on crazy over here. You hair looks very nice ! Your hair looks amazing straight Laura. Gorgeous lip shade & if it's the Zara cape I'm thinking of it's a great buy! 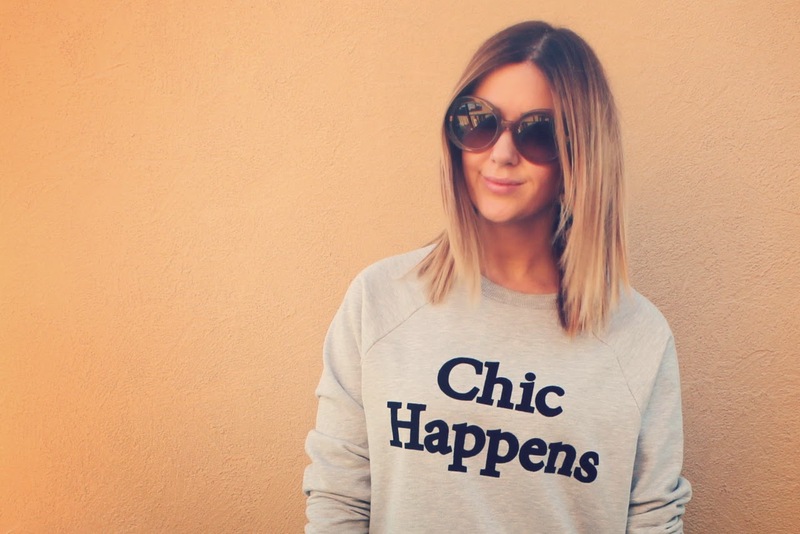 this jumper is very beyonce 7/11 inspired... great post! Your hair looks lovely! Keratin treatment does wonders, my hair was silky and shiny for weeks after having it done! 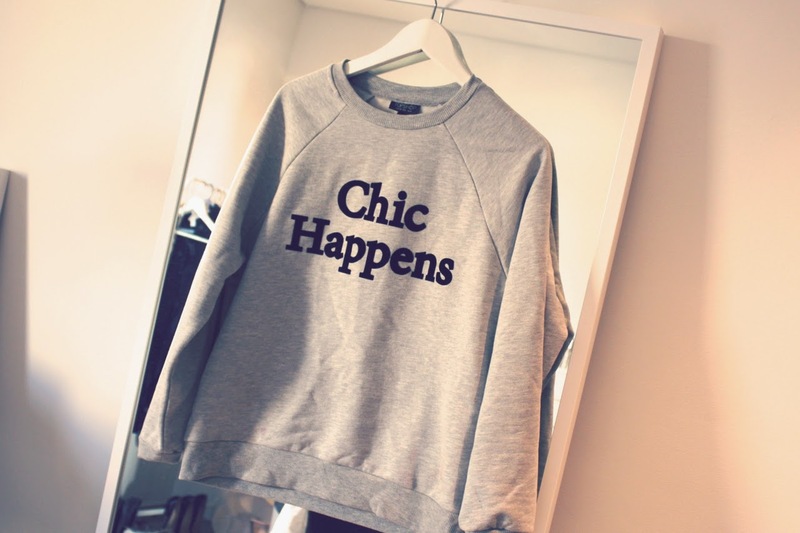 I also love that 'chic happens' jumper, it's adorable. Your hair looks amazing. At what salon did you get that treatment done? 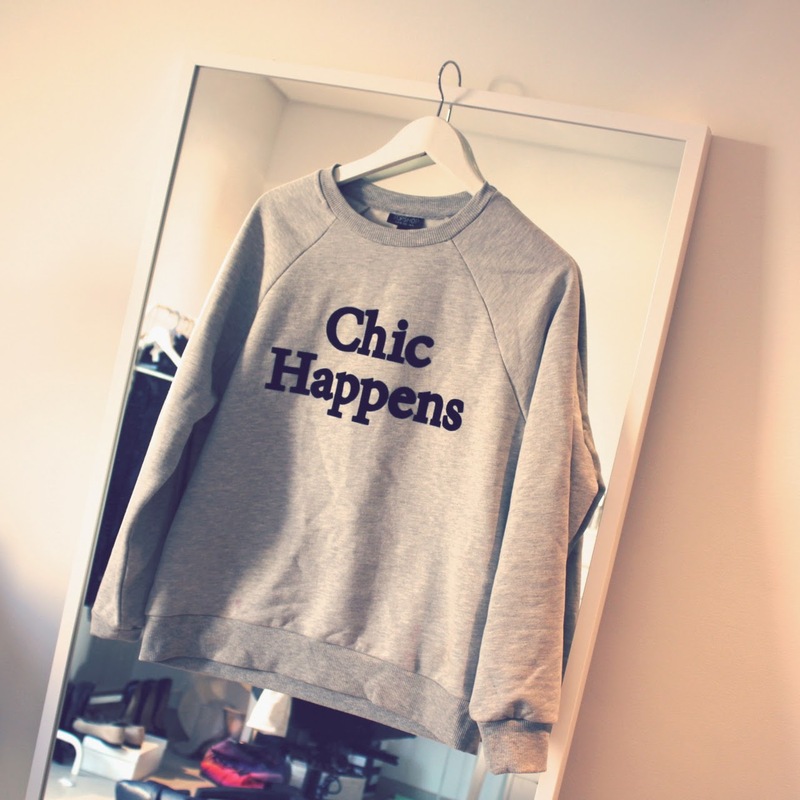 Chic Happens. I love it! Your hair and makeup look amazing! You're hair looks absolutely amazing!